While Nature Needs More would prefer that the natural world was protected by the precautionary principle and a conservation-based convention, the reality is that CITES is a trade convention and since the 1970s the trade approach has taken precedent. It is pretty apparent that most signatory countries believe trade is the way and will not be persuaded otherwise, at least in the short term. Challenging this from a basis of ideological opposition simply ensures that nothing changes. If the strategy doesn’t work, you change the strategy. If we have to acknowledge that trade will be used for the foreseeable future, then at least the governments, agencies and organisations supporting and driving trade must demonstrate that the system administering and monitoring this trade is fit for purpose for the species it is there to protect. In addition, we believe it is imperative that any government and organisation that supports sustainable use, invests not only in fixing the CITES trade system, but also resources it at appropriate levels to ensure the ‘sustainable’ bit! Clearly, this is not happening and may never have happened. In speaking to representatives of global and specialist conservation organisations they are concerned that the flaws in the CITES trade permit system could become transparent to the general public. Of course they would be, as it reflects very badly that they have allowed this to go on for decades. Many in the conservation sector know how flawed the CITES system is but the general public (beyond the conservation activist community) has no idea. 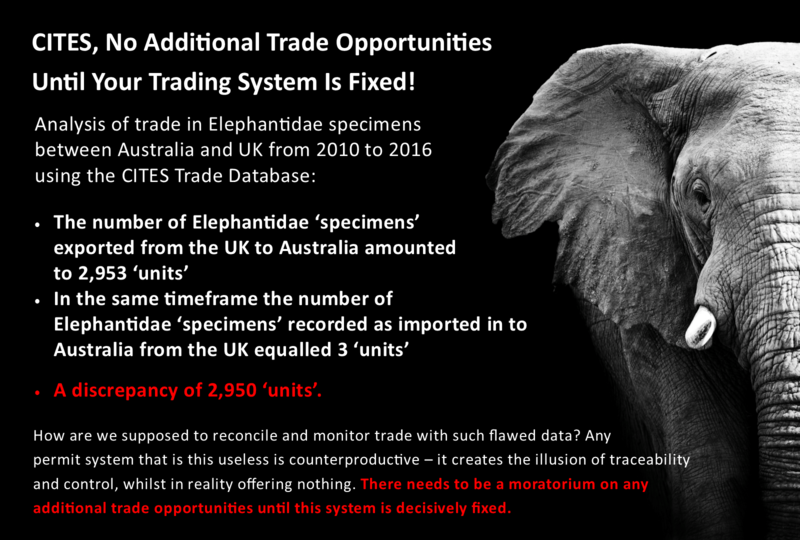 Given the people and businesses that want to maintain a trade in wildlife consistently use the statement that they ‘comply’ with all the CITES trade permit rules, it is imperative to take into account the ability of this system to comprehensively monitor trade and the movement of these animal body parts etc. There is a growing body of evidence that the CITES trade permit system is not fit for purpose and, in many instances, held in contempt by representatives of agencies who use it. 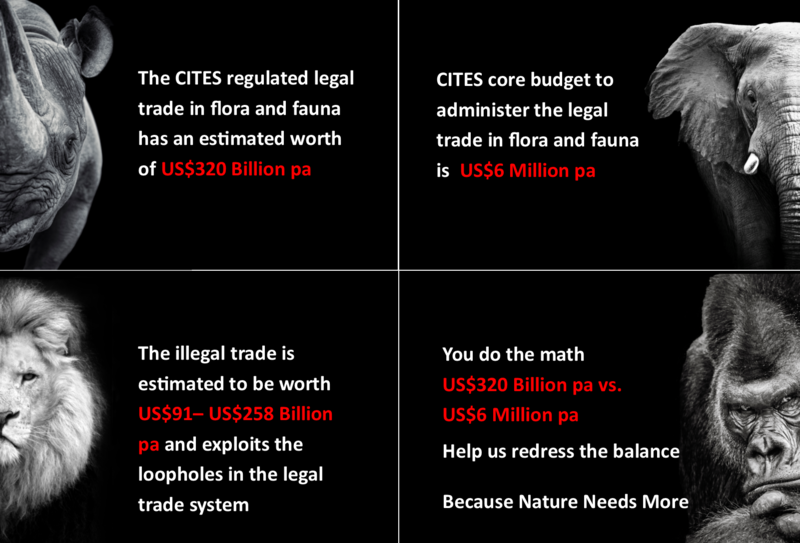 For the CITES (or any) system to be relevant in preventing illegal trade, the legal trade monitoring system needs to be completely transparent and provide the ability to track individual items from origin to destination, without any loopholes, gaps or opportunities to launder illegal items into the legal market. Such systems readily exist; for example, spare parts in the aviation industry are tracked with this level of diligence. 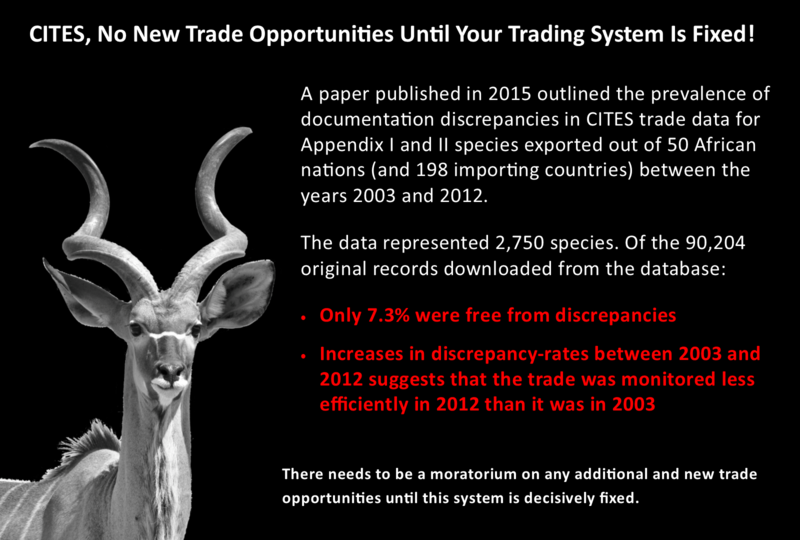 In reality, CITES has a trade and permit system that is completely useless in reconciling even the most basic import and export data. Items are not identifiable, not tracked and even quantities recorded are completely ambiguous (such as ‘10 units’ of ivory, which is less than meaningless). Many countries do not require import permits, making reconciliation and auditing impossible. Permits are mostly paper based and generally not reconciled with customs documents such as lading bills or air way bills. When asking representatives of some of the most well known global conservation organisations why they have enabled this sorry situation to persist, sadly too many responses took the form “We know the system isn’t great, but it is all we have”. Whilst this pattern of response may be attributed to mediocrity, more worryingly was that, when pushed, some admitted that they don’t say anything that would upset the CITES secretariat or the parties as they “don’t want to be uninvited” to the working group meetings in Geneva or uninvited to the Conference of Parties, robbing them of the status of ‘having a seat at the table’. To clarify, only signatories (governments) have an automatic invitation to CITES meetings and working groups; the conservation NGOs are invited by the ‘grace and favour’ of the formal stakeholders. It is very clear that many believe trade is the panacea or, as a very minimum, have stuck with the sustainable use model because they haven’t got the creativity to come up with more innovative solutions. If they are sticking to the trade mantra, then the best thing for the caring public to do is challenge their governments (the 183 signatories) to invest in fixing this currently flawed system. Before we propose what can be done, first let’s highlight just a few of the numerous examples which demonstrate how useless this system is. 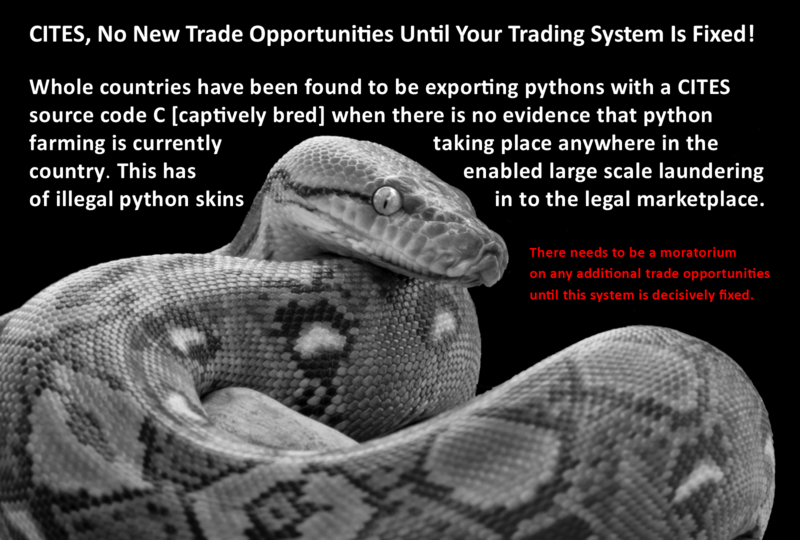 Information is from the report: Assessment of Python Breeding Farms Supplying the International High-end Leather Industry. Information is from the paper: A roaring trade? The legal trade in Panthera leo bones from Africa to East-Southeast Asia. 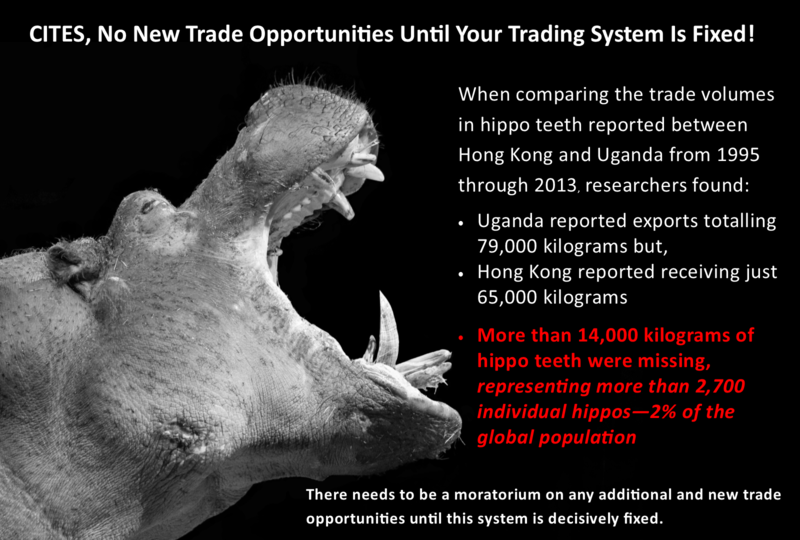 From the paper: Missing teeth: Discordances in the trade of hippo ivory between Africa and Hong Kong. that all of these species are included in CITES is because they are vulnerable to over-exploitation, and extinction”. 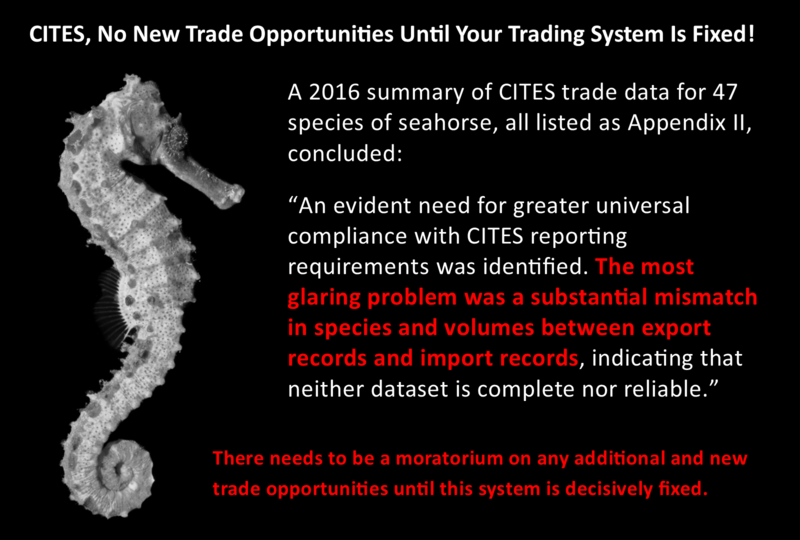 From the paper: Opportunities and challenges for analysis of wildlife trade using CITES data – seahorses as a case study. 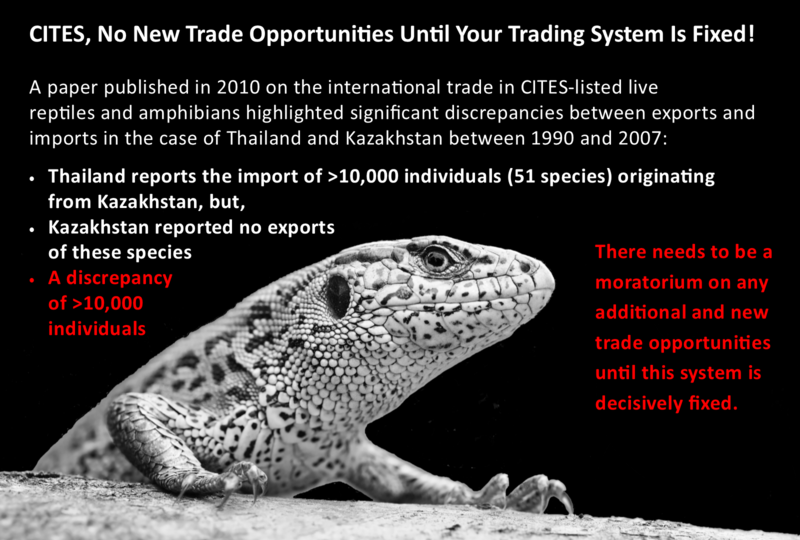 From the report: The Role of Thailand in the International Trade in CITES-Listed Live Reptiles and Amphibians. Information on the estimated scale of the illegal trade can be found via the 2017 World Customs Union Illegal Trade Report. Furthermore, this report highlights that the estimated profit from the illegal trade in flora and fauna to be between $91- 258 billion USD per year, and stated, this is an amount that is, according to the United Nations Environment Programme, growing at 2-3 times the pace of the global economy. Given the evidence that this trade system is not fit for purpose, we believe that there needs to be a moratorium on all new trade, e.g. rhino horn or additional quotas, e.g. 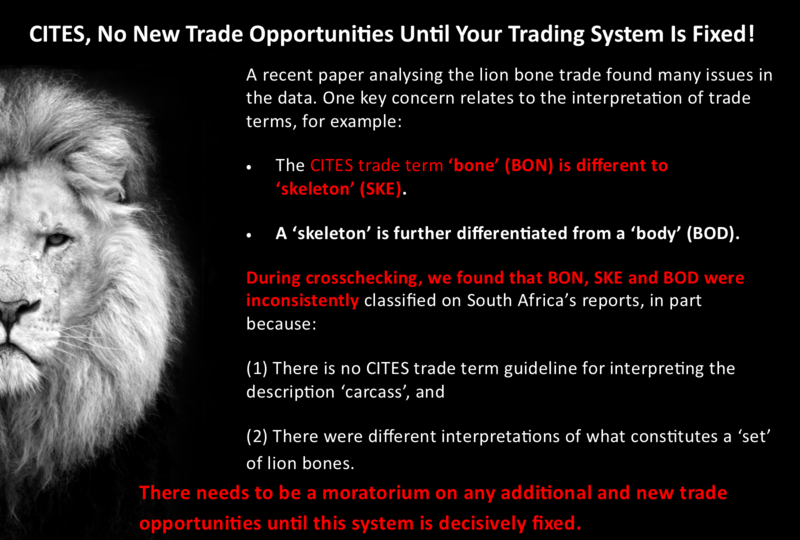 lion bone until the system is decisively fixed and resourced. This and how to do this needs to be a part of agenda at CITES CoP 18, Sri Lanka, May 2019 and beyond. Starting the discussion – What can be done? To summarise the problem, understandably those of us who care about wildlife and are aware of the failure of current conservation efforts are angry that a convention ostensibly dedicated to wildlife protection does nothing other than enable trade at massive scale with minimal regulation and oversight, resulting in plummeting populations. In addition, traders and traffickers alike are making massive profits of both the legal and illegal trade. Given the prevalent ‘free trade’ and ‘economic growth’ ideology, traders have ready access to lobby governments whereas activists and those opposed to trade lack both access and representation. With mainstream conservation NGOS neutered by relying on government and corporate donations, we seem to be in a no-win situation. As we have zero chance of replacing CITES in the short-medium term, we need to focus our efforts on fixing the CITES system. This can only be done with the help of governments (CITES signatories), as only governments can make proposals for consideration at CITES Conferences of Parties. Hence our effort has to go into lobbying our members of parliament and any candidates standing for election. Right now, I’m not sure if putting pressure on the mainstream conservation NGOs to take a tougher stance on fixing CITES is worth the effort. Charge a levy on all trades approved and carried out under CITES rules to put CITES funding on a sound and sustainable foundation adequate to the task of assisting all parties in creating a transparent, traceable and tamper-proof trade system. 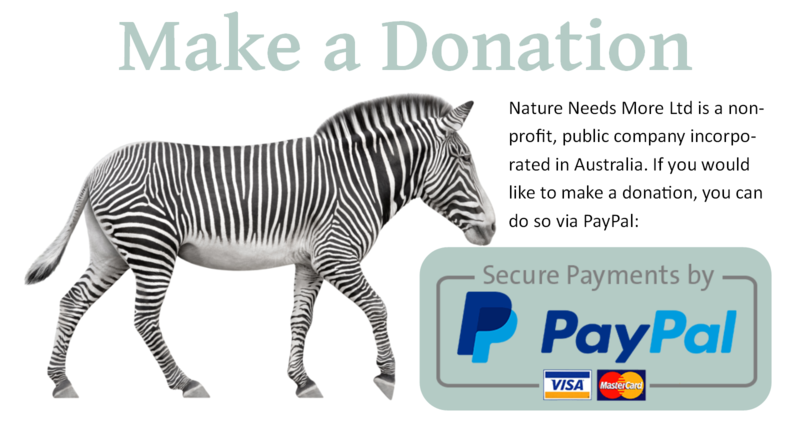 The letter and reasoning behind the approach can be read via: https://natureneedsmore.org/ensuring-cites-is-relevant-and-effective/ Copies of this letter were also presented to the Australian Federal Minister for the Environment and sent to both DEFRA and CFO in the UK to name a few. Wherever you are in the world we would like you to send the CITES ltter outlining the reverse listing approach to your local MP; you can download the letter and the bones of an email to introduce this to your MP via: http://fortheloveofwildlife.org.au/cites-time-fix-basics/ (Should you want to, you can also send it to any NGOs you are a member of or donate to). Point out the discrepancy between the value of the legal trade and the resources available to monitor it. Provide a couple of examples of the flaws inherent in the system and what the consequences are. Please feel free to snip any of the examples from the blog post to use in to your correspondence. Or create your own for whichever species you care about; evidence of the discrepancies in the trade monitoring system are not too hard to find! To make this a worthwhile effort, we need to reach a lot of people who are currently assuming the system works. Educate your friends and co-workers and ask them to send letters too. We certainly know from our lobbying efforts with politicians that letters and phone calls to their offices work a lot better than posting on social media. 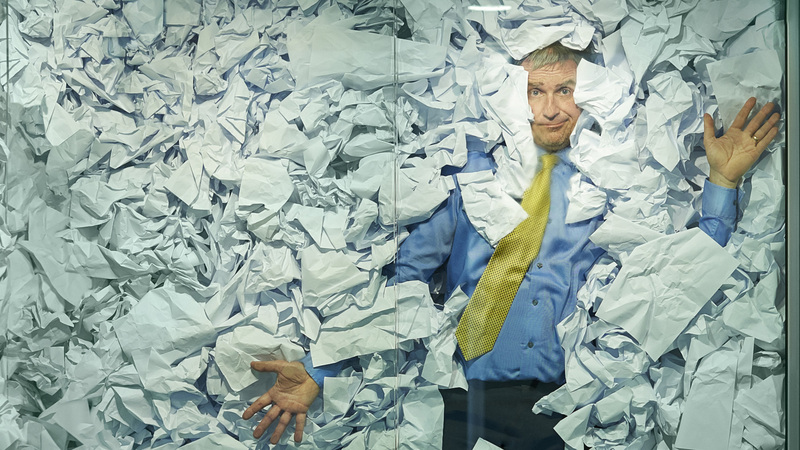 Meetings are the most effective approach, but not always easy to get. In any case, follow up if you do not hear back. Politicians learn to ignore 99% of what they are bombarded with, but persistence pays off. You can also use your local paper and radio station to get some coverage. National media will ignore these issues, but local media are always on the lookout for stories. In our experience MPs pay a lot of attention to local media as well, so the two strategies can be combined. In closing, we have 2-3 months to get this message out if we want to get attention at the CITES CoP18. 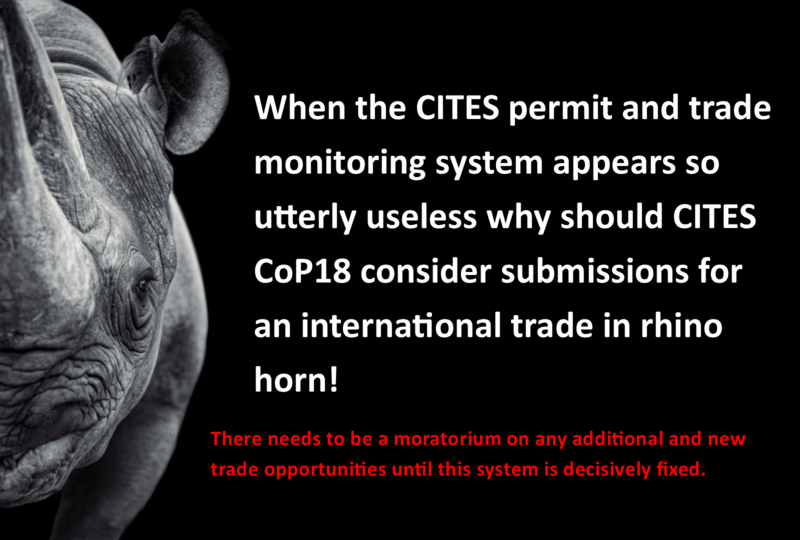 The caring public (beyond activist groups) need to know more about the CITES system and that a trade system that is this useless is actually counterproductive – it creates the illusion of trackability and control, whilst offering nothing. It has lulled the concerned public into a false sense of security. CITES has had over 40 years, as the key agency and facilitator of trade in fauna and flora, to evolve and perfect a system critical to conserving wildlife. If CITES and conservation agencies want to continue to be relevant on this issue, they must Fix The Basics or step aside, so a ‘conservation’ focused rather than a ‘trade’ focused system is put in place. We would like to thank Donalea Patman of For the Love of Wildlife and Hayley Vella, whose work tackling the Australian domestic trade in elephant ivory and rhino horn has helped inform this blog.